We arrived in Zermatt after a 5 hours train ride from Jungfraujoch, hungry, tired and desperately in need of a hot shower. 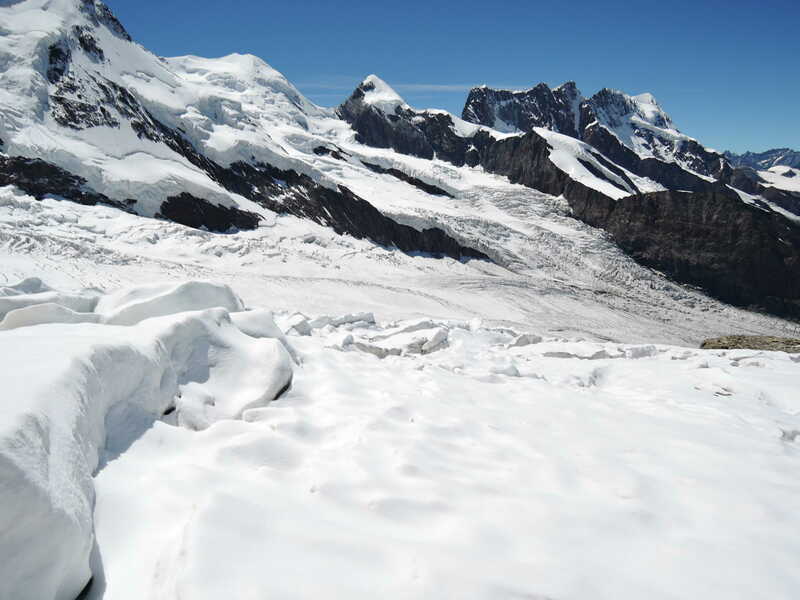 The perfect weather was a reminder of the missed opportunity to climb Jungfrau. Maybe next year. Now we had to focus on the next climb. We went to our hotels, and after a session of sorting out gear and washing clothes it was dinner time. With a tight budget, the only options was to head to the supermarket and cook the food ourselves. The encounter with one of the hotel guests will always remain in my memory. I was returning to my room from the hotel’s balcony with a pot of sausages in one hand and the gas stove in the other. Judging by her facial expression, she must have been stunned. But I’m a mountaineer so who cares. I did actually went to Brown Pub Cow for a burger later on when I met Cosmin. Not bad, but I have a feeling the meat might have been frozen and not fresh. I was gonna find out that due to his tooth infection he will be staying in Zermatt. 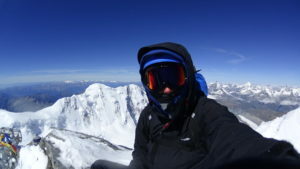 The only options for me now were either to find a party and join them, or try a solo ascent. I wasn’t going to give up that easy. 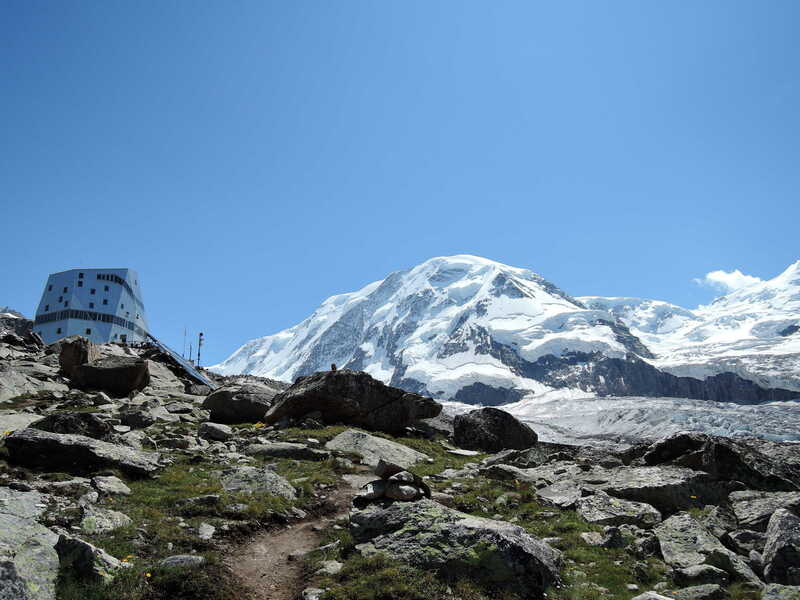 Determined to reach the top of Switzerland, I left a part of my luggage including the rope at the hotel, and left for Monte Rosa hut. One has to take the Gornegrat railway and stop at Rotenboden. From there sign posts direct you on a clear path – 3H 20 min. You slowly start descending towards the glacier with views over all the Monte Rosa massif. It’s simply beautiful and I would recommend it even as a 1 day trek. But don’t be fooled by the train access. It requires glacier travel and proper equipment. 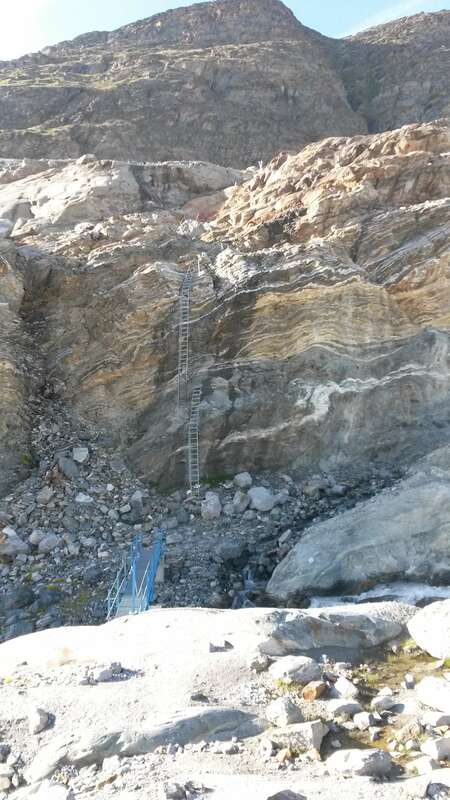 The access to the glacier is done by 3 metal ladders on a vertical wall, a metal bridge over a stream. 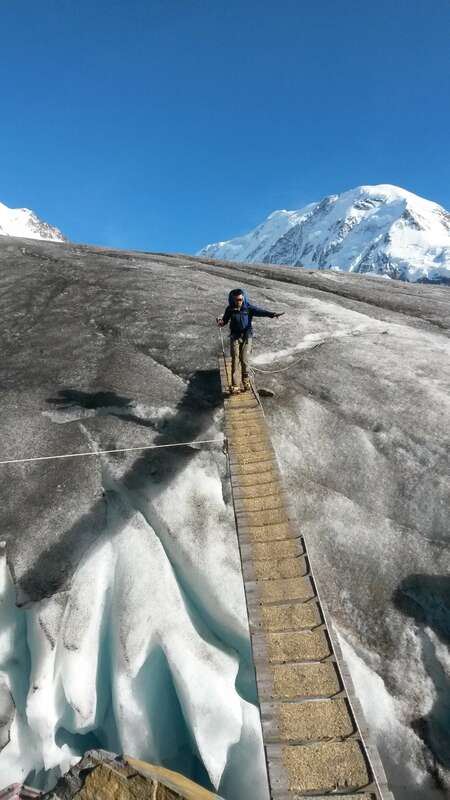 It continues with a short rocky sections protected with rope and a wooden bridge that links it to the glacier. Just before crossing it’s a good idea to put your crampons on. Helmet or rope is not required. Cross with extra care as the bridge is unstable. The glacier is just ice mixed with mud and rocks, and a clear white path usually will guide you. There are also wooden poles and crevasses are usually visible. It’s pointless to describe the route as this will most probably change from year to year. Soon you’ll find yourself in a huge hole at the junction of the two glaciers. Be quick and stay in the middle as rocks are falling from everywhere. 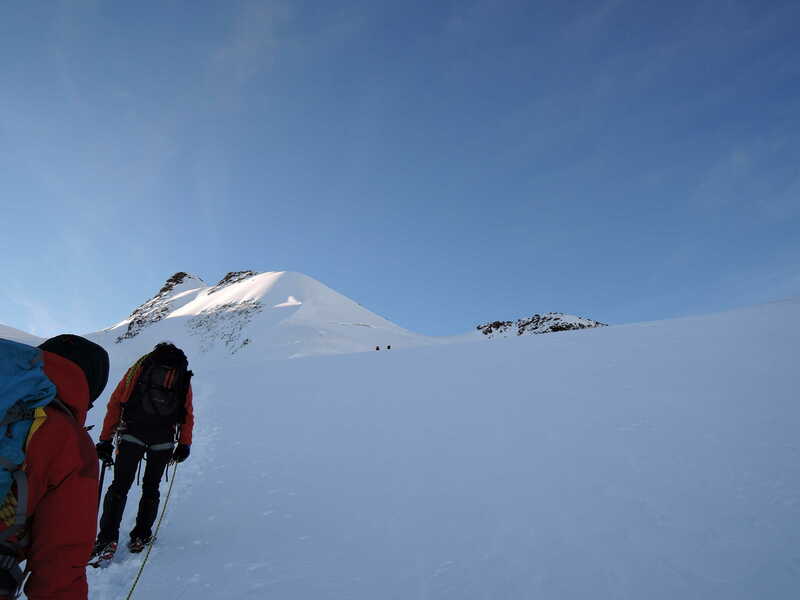 Crossing of the Grenz glacier is easy and fast but now the ascent begins. First through rocky terrain and by 2 glacier lakes and then up the vertical wall following a man made path. Even though the metal silver cube is visible from the train station, it’s a long walk to the hut. The new hut was opened in 2009 and is completely covered in solar panels over 5 floors. 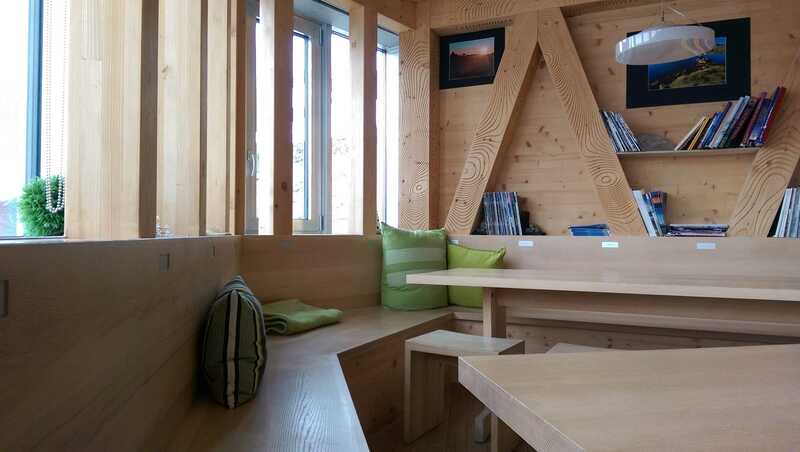 At 2883m is a true architectural wonder. 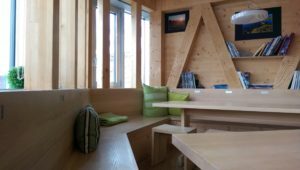 It’s more of a hotel rather than your standard mountain hut. Owned by SAC, it offers 120 beds and a 12 bed winter shelter. 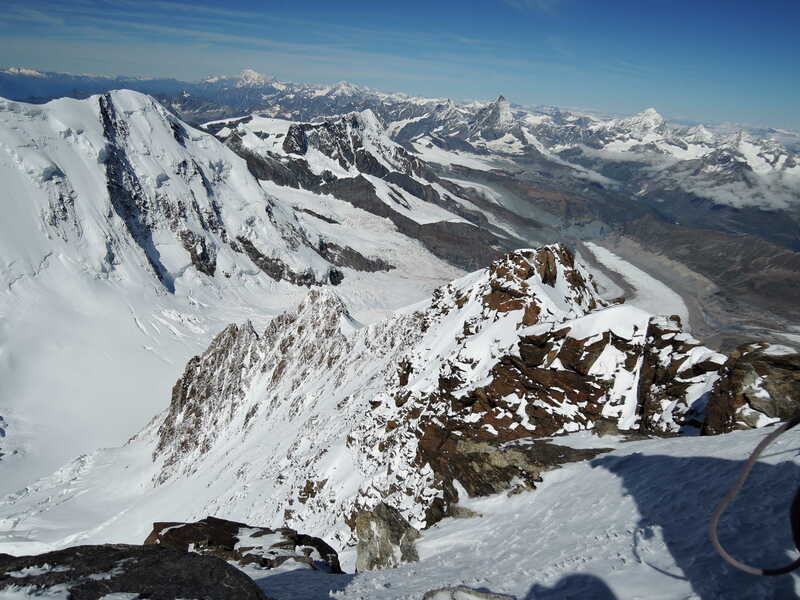 It can also be accessed from Zermatt via the Gorner glacier in about 5 hours. It’s clean, very clean and modern. The toilets are better than in some of the hotels I’ve staid. It has a hot shower and running water. Beds are very comfortable and each has a dedicated space for packs and personal belongings. At 8am the room must be cleared and a cleanerr vacuums all the hut. Downstairs is the dining room and under, drying space for clothes and boots. Prices are reasonable, the food is good and they always ask if you would like more at no extra cost. The hut keeper is a bit grumpy and doesn’t speak much English but he lady and the young chap are very nice and helpful. Is simply the best I’ve ever seen so far. But there are a few negative parts as well. Not very pleasant to wake up at 1 a.m. and clear the room when you leave for a route. A small price to pay for the comfort you get I suppose. But the most annoying thing it has to be the helicopter taxi that brings rich people to the hut. With fancy expensive clothes they come, take pictures and then leave. I have felt like a zoo animal. And it doesn’t stop here as they even go circle around the cliffs while people are climbing. Soon after I’ve arrived the weather changed. Dark clouds and high winds announcing a not so pleasant night. There was no hope for going up that night with the storm coming. The next day was no better. Most of the ones there had already climbed and they were all going down. It was me and 2 other girls still in the hut. They both had snow blindness and no insurance so had to wait and heal. But I was determined to climb and hoped for the weather to clear. It was only in the evening when the snowing stopped and people start to show up. I waited in the dining room trying to find if there’s anybody attempting Dufourspitze but there were no English speakers. So I went to sleep with the thought of waking up in time for 2 a.m. breakfast. There were people still coming from Zermatt and I didn’t manage to get much sleep with all the noise. Couldn’t have been more than 3 hours when the alarm rang. The sky was clear and the strong winds would mean the fresh snow must have frozen overnight. Quickly packed my bag, left the rest of my clothes in a basket downstairs and went for breakfast. They serve the regular tea/coffee with butter and jam. 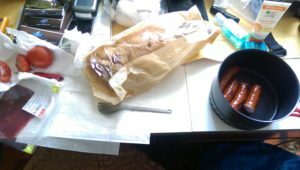 Cereals and milk, sausages and some kind of cheese. I filled my 1L nalgen with tea and left to gear up. There were a few parties leaving which came as a relief. I really didn’t want to be the only one crossing a glacier on fresh snow. On the 6th of August at 2.45 a.m. I left alone for the summit. Determined to at least try getting to the top. By the time I left the wind calmed down and temperature was above 0. I turned on the GPS and start ascending. At first the route is marked but quite confusing. It’s a mix of orange poles, blue paint and rock piles. Each seems to be going the same direction but different paths. Nevertheless all go through the massive boulders and rocks and head to Monte Rosa glacier. Be aware that at some point the right trail splits. I can only assume the right side is for Liskamm. This part will be ascended in the dark and it takes somewhere around 1h and 30 minutes. 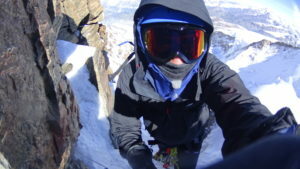 It is here where I’ve met the two climbers that were kind enough to let me join their party – Thibaut and Petr. I would have preferred a solo ascent but there was no time for a second try in case of failure. I could not take that risk. We roped just before the glacier, as the last part is a 50 degrees rock face covered in a layer of ice. 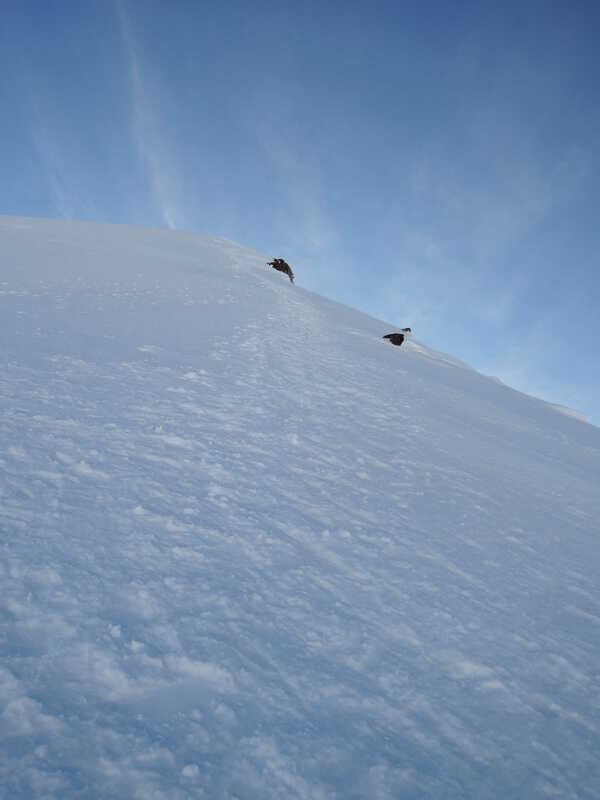 Once on the glacier we slowly started to gain altitude avoiding the massive crevasses. Snow was hard and even though at times you could tell it’s a snow bridge there was no fear of falling. It started to be quite cold by now and also windy. Few light ahead from a party of two. I turned my head and there were two more groups behind us. Two guides with their clients and a young girl with her father. The first morning light announcing the sunrise. What a view. The route follows an undulating course up the glacier bearing left at the beginning. And then right of a massive rock face at about 3900m to reach Scholle. By now the head torch is not needed anymore. Is worth taking a short break and enjoying the sunrise over the valley. From here, to the left is the route to Nordend and East ridge of Dufourspitze via Silversattel. We continue right gaining altitude and making our way to the Satteltole. Now you should be able to see the Sattle where the West ridge starts. We stop again for hydration. I’m already hungry but the others want to continue. Luckily I have a Snickers, frozen, but it will do for now. Better than nothing. We continue our ascent and half an hour later reach the bergschrund. A small snow bridge across. Looks precarious but there is no other way so we go for it. I wonder if it will still hold on the way back. Minutes after, we reach the Sattel. 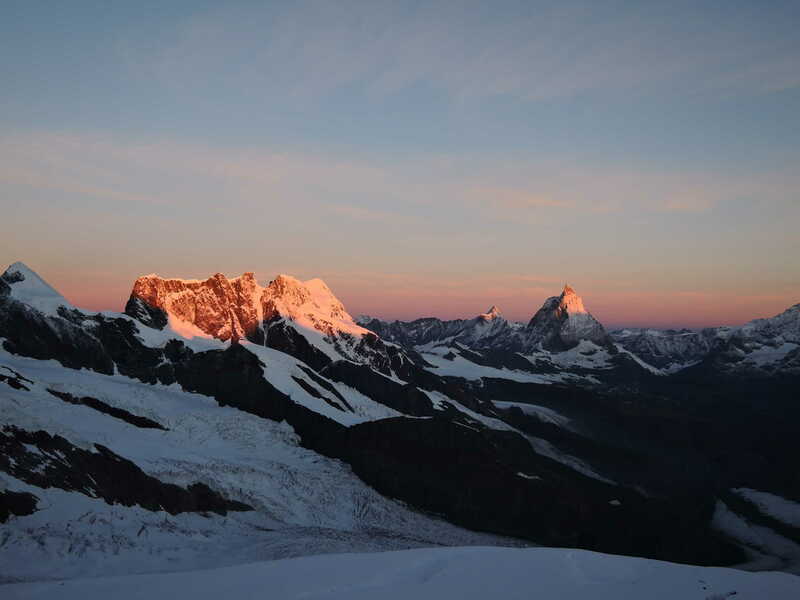 The first views on Signalkuppe, Punta Parrot and Piramide Vincent. We can’t see any ridge yet, but only a huge steep slope which looks like 50 – 60 degrees. Is frozen and icy at we’re really thankful to the party ahead for breaking the trail. It also started to be very windy and cold. That warm tea is most welcome now. I add my fleece and goretex jacket on top of the softshell and we slowly make our way up. At the top of the slope the West ridge starts, but the summit is still not in sight. It was extremely windy so I decided to have my hoods on rather than my camera. I wish I would have filmed it though, but I enjoyed it so much I plan to return. Is mostly grade I and II and a short chimney of III. It used to be a fixed rope there but now the route has been cleaned. Somebody was kind enough though to leave a sling with a krab. Most of the part, there are good hand and foot holds. Is quite exposed and the extreme wind makes your heart rate go nuts. The only tricky section is just before the mentioned chimney. It requires a bit of dexterity as you have to squeeze under the rocks. You top onto a knife ridge that takes you to the final pitch and the summit. The route is simply magnificent. I’ve climbed a few UIAA II so far but this takes the 1st place. 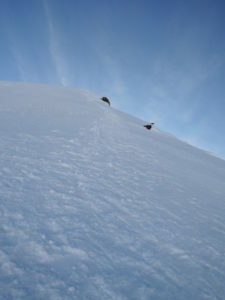 It’s a mix of everything – steep slopes, knife sharp snow ridges, chimney, a mix of grades I to III and splendid views. I had a couple of slings and nuts with me but the guys didn’t want to use them. I probably would have if I was leading. We instead used rope work and there are enough natural anchors. And there we were, at last on top of Switzerland 8 hours later. It’s a feeling that can not be described. Now it all makes sense. The journey is as important as the summit. I looked back to the ridge and could not believe what I’ve just climbed. I felt proud that only after a few climbs my skills have improved so much. 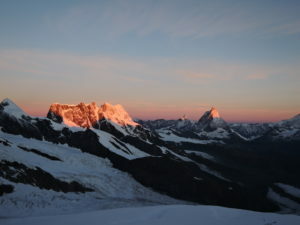 I look in the distance and my dream is closer than never – the Matterhorn. A perfect day surrounded by all those 4000ers. There was nobody on the top and we see the party ahead already on the way to Marguerita hut. Just behind us the girl with her father. She looked to be 16 – 18 years old. Very impressive for such a young lady. I looked over the other side where it used to be the abseil point. Nothing there. Indeed the rope has been cut. Our 60m rope was enough to reach the bottom. We all agreed the best way is to go back and not take the East ridge. I always find easier the descent and we were indeed much quicker. But no match for the other party. When we reach the Sattel they were already a few hundred meters below us. And they were rushing for good reason. The sun was shinning melting the snow bridges and uncovering a minefield of crevasses. We managed to get across without any fall though. Occasional dip to the waist in the melting snow but nothing else. We got back to the hut a little over 3 p.m at a slow pace. I had a hot soup to warm my sore throat. And then a beer because well.. I deserved it. We’ve made it and I can not thank enough to Thibaut and Petr for having me in their party. Without them my journey would have most probably stopped just before the ridge. I soloed Monch but that was easier and less exposed. Is hard to say without being in that situation. I am crazy but is good to know your limits and know when to stop. Such a perfect day and only 3 parties on top of Dufourspitze. I’m not a fan of big crowds anyway. After such a long day, the way back to the train is painfully long and seems to never end. It took us almost 3 hours back to Rotenboden. My energy reserves were depleted. I’ve never been more happy to see a train in my life. We’ve also met again the girl and she was carrying what looked like a 100L pack. Her father walked so they can save money and she had to carry all the load. What a great parent to make these sacrifices so your kid can fulfil her dreams. Down in Zermatt we exchanged contact details and wish best of luck to each others. I went back to my hotel tired but happy that I’ve achieved my goal. But also sad as I know my climbing season for this year has ended. Oh how I wish I could climb every day. The more time I spend in nature the more I hate the always crowded urban areas. For more photos of the trip, as always, check the galley.